Q From Bill Morris: While visiting England recently I went to the Royal Observatory in Greenwich. While I was there I was told that the red ball on the observatory was raised each day. In the old days the ship captains in the Thames would look for it in order to set their timepieces. I have no problem with that. We were then told this is the origin of the expression on the ball. Far be it from me to question an actor dressed as John Flamsteed, but I thought I would check with you. Can you confirm or deny this information? A I deny it, vehemently. It’s sad that someone who works for a famous scientific institution like the Royal Observatory should go so badly wrong when it comes to a simple matter of looking up a phrase in the dictionary and checking a bit of history, but that’s the way it so often is. Details first. (As you’ve been there, you know all this, but I’ll just explain to the masses.) The red ball is what’s called a time ball. The one at Greenwich was — still is — used to signal 1pm local time. 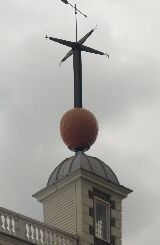 At 12.55 the ball is raised halfway up its mast and at 12.58 it is sent all the way to the top. At 1pm exactly, it falls. Time balls were common in the nineteenth century before easy access to wristwatches and radio made them redundant. They were especially important to seafarers, who needed an accurate time reference to check their navigational chronometers. The Greenwich time ball was first used in 1833. If we turn to the Historical Dictionary of American Slang we find that the first recorded appearance of the phrase on the ball is from much later: the early years of the twentieth century. By itself, that’s not enough to disprove your costumed interpreter’s thesis, but when we look at the way it was used around that time, it’s obvious that it comes from sports, in particular from baseball. Hahn’s case is no different from that of many other good pitchers. He has simply arrived at the stage which all good pitchers dread. Ball players do not attempt to explain why these things are. They say: “He’s got speed and a curve, but, there’s ‘nothing’ on the ball.” This vague “nothing” is the thing. It means that the pitcher has lost that little “jump”, or some peculiar deceptive break with which he has fooled batters. If he loses that, he is gone. By the 1930s, it had broadened its application and appeal to mean somebody who was especially alert or capable, presumably by being amalgamated with an earlier expression that advised budding sportsmen to “Always keep your eye on the ball”. On the ball was later still exported to Britain. Last modified: 14 October 2006.